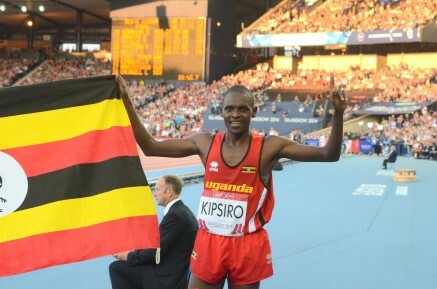 1st August 2014 – In one of the closest finishes of the entire championships Moses Kipsiro (UGA) defended his Commonwealth 10,000m title. Content to sit at the back of large lead group for much of the race Kipsiro began to take closer order with 5 laps to run. At the bell the group was down to 4 and still Kipsiro bided his time. The pace picked up with 200m remaining and a lead three of Cam Levins, Josphat Bett and Kipsiro were clear but which medal they would receive was still be decided. Levins kicked hard with 120m to go but could not break clear and Bett and Kipsiro were able to pass him, one on the outside, one on the inside. Finally in the final few inches of the race, Moses hit the front for the very first time and took the gold medal by just 0.03 seconds. Ugandan teammate Timothy Toroitich (UGA) finished 8th. In triple jump qualifying Philips Idowu (ENG) sailed into tomorrows final needing just one attempt to secure automatic qualification with a jump of 16.70m. The session also saw the heats of all four relays and PACE athletes contributed to their individual countries progressing. Christine Ohuruogu (ENG) anchored her team to a heat victory and Matthew Hudson-Smith (ENG) ran leg two for his heat winning quartet both in the 4x400m. As expected six time Olympic gold medalist Usain Bolt (JAM) brought his team home first but it was not as straightforward as it may have seemed. Unfortunately opening leg runner Kimmari Roach (JAM) pulled his quad after only 40 meters and he did brilliantly to complete his leg and contribute to the team progressing.